The University of Virginia has long been a bastion of white supremacy and its validating scholarship. The book’s author identifies how such antidemocratic sentiment has long gestated in academia generally, encapsulated in neoclassical economics and its validation of alleged rational economic behaviors -- theories that originated in opposition to the New Deal and the Civil Rights movement and predominate in today's conservative and far-right movements today. 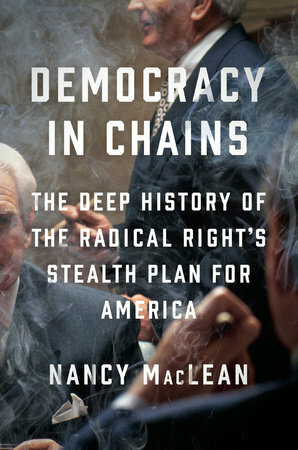 In a moment of high political and ideological tension, it is not surprising that Nancy MacLean’s new book, Democracy in Chains, might strike a nerve with the public: the book offers a close account of the early years of one particular strand of right-wing economics scholarship. And after the events of this past weekend, when white supremacy returned to the very grounds of the University of Virginia where a large chunk of MacLean’s story takes place, interest in what MacLean has to say will likely grow. As well it should, because MacLean’s account explains what happened in Charlottesville at two different but related levels. First, MacLean describes how the University of Virginia has long been a bastion of white supremacy and white supremacy–validating scholarship. Second, the foremost concern of MacLean’s book is identifying how white supremacist and antidemocratic sentiment can have an astonishing long gestation period. By taking aim at the legacy of James M. Buchanan, the Nobel Prize–winning economist whose scholarship and political philosophy reverberate through the conservative movement to this day, MacLean’s book has pitched intellectual historians such as herself against Buchanan’s academic heirs, to whom she ascribes complicity in a long political devolution. While a few nonaligned scholars have entered the fray, the debate has so far largely been drawn along ideological and disciplinary lines. This is unfortunate because MacLean uncovers a crucial history in her book, one that economists especially need to grapple with. Heirs of the Virginia School—and their billionaire backers—partake in a strategy of smoke and mirrors to disguise their politics as academic work. It is evident from reading Democracy in Chains that MacLean takes a dim view of the economics profession. She writes scornfully about its standard assumption of rational behavior on the part of individuals and about the absence from the field of any notion that social power of the rich over the poor determines social outcomes. It would be reasonable for the reader to assume that MacLean does not know many economists, and those she does know, she does not like. I would go so far as to say the book starts from the assumption that economists would be a hostile audience no matter what it says, and hence it is not worth constructing an argument that might appeal, or even make sense, to them. That is a shame, because MacLean does have quite a lot to say to economists that they do not already know and, given the tone of the book, that they are unlikely to believe solely on her authority. Namely, that foundational elements of their field arose out of a backlash to both the New Deal and the civil rights movement. Each of those political watersheds was built on the public pressure brought by small-d democratic social movements—movements that forced the government to intervene against the interests of a wealthy elite in order to deconstruct the existing hierarchy. MacLean shows how the building blocks of the neoclassical revolution in economics research, especially Buchanan’s work around Public Choice (a theory that uses economic tools to address political decision-making), were born from the backlash to these “big government” or “collectivist” “interventions.” Indeed, the new history that MacLean brings forward, and that Bethany Moreton’s review in this journal expands on, is that Buchanan and his Virginia research institutes were at the center of the political and academic architecture of white supremacy in the 1950s and ’60s. MacLean overstates the centrality of Buchanan and his “Virginia School” of Public Choice as the vanguard of the broad free market economics backlash to the New Deal and the civil rights movement, but she is not wrong that that was its aim and that this essentially political motivation had a profound effect on its scholarly trajectory and its intellectual legacy. Economists of all stripes should take note. There are, after all, numerous historical precedents that rhyme with Buchanan’s strategies, and it is important to understand the context that gave birth to Public Choice theory and to neoclassical economics more broadly, to better see what they were (and are) up to. It is also vitally important to see how the heirs of the Virginia School—and their billionaire backers—still partake in a strategy of smoke and mirrors to disguise their political positioning as academic work. This essay first discusses precedents for such an intellectual-political alliance of the right in American history. It then draws out the conjunction between Buchanan’s academic clique and mainstream economics. Finally, it explains how Public Choice diverged from the mainstream of the economics profession in recent years, while at the same time pressing forward with its political and academic agenda on the strength of financial support from ideologically motivated billionaires. To understand the neoclassical revolution in economics and its connection with white supremacy, it is worth extending the history of the nineteenth century that MacLean recounts to include Reconstruction and the circumstances under which it ended. In the first half of the nineteenth century, the era of the “Second Party System,” the national debate about economic policy was over the federal provision of public goods, or “internal improvements.” At the time, South Carolina statesman (and two-time vice-president) John C. Calhoun espoused the philosophy that the only political right that matters is the right to own property. Anything that interfered with that right, according to Calhoun, is ipso facto illegitimate, and in order to preserve it, property-owners should have veto power over government policy to guard against tyranny of the propertyless majority. But the only property that Calhoun was concerned with was the property of slaveowners, and he wanted to prevent the government overreach of any accretion of federal power for “internal improvements” that might bolster the power of that property to someday overturn the system of their subjugation. As Richard Hofstadter put it, Calhoun was “The Marx of the Master Class.” He despised democracy because he saw it as a threat to capitalist white supremacy, and he despised public goods because he discerned the threat they posed to antidemocratic social and racial hierarchy. It can be argued that a right-wing economic and social agenda ushered in white supremacist street violence at the university where Buchanan did his most influential work. MacLean writes a great deal about Calhoun, since his philosophy of radical minoritarian rule (protecting the slave-owning minority’s rights from federal intrusion) is one that Buchanan’s followers have played up and celebrated, however coyly. In 1992 Buchanan’s disciples Alex Tabarrok and Tyler Cowen wrote a paperexplicitly likening Buchanan’s political theory to Calhoun’s, but with only a passing mention of slavery as the ultimate motivation for the whole system. The fact that Calhoun explicitly stated that the property in question was other human beings while Buchanan and his acolytes did not does not relieve their complicity in that immoral and discredited intellectual system, a system that makes sense on its own terms only if black people are not people. To overlook the racist stench attached to Buchanan’s intellectual projects and that of his heirs is to fail to give an accurate account of it. But Calhoun and the antebellum proslavery political interest is not the most apt historical precedent for Buchanan and Public Choice, even if it is the most obvious. The better antecedent is rather the political movement that overthrew Reconstruction in the 1870s and reinstalled former slaveowners, the so-called “Redeemers,” in positions of supreme power across the South. Like Buchanan’s Public Choice theory during and after the civil rights movement, this strategy married reactionary southern white supremacy with a not-explicitly-racist free market economic and political agenda. MacLean does not mention this history but she should have. She includes in her conclusion only a passing reference to late-nineteenth-century America as the model end-state for Buchanan’s and his heirs’ political advocacy. In order to regain the power they had lost to the new black electorate under Reconstruction, the Redeemers forged a de facto alliance with a class of elite northerners, what in her book The Reconstruction of American Liberalism (2002) the historian Nancy Cohen calls “liberal reformers.” Following the Panic of 1873, class conflict came to dominate the national political debate. The lynchpin of the Redeemer strategy was activating the first wave of American-style “free market” economics to galvanize northern elite opinion. While initially the liberal reformers were careful not to adopt explicit racism in their appeals, race-coded rhetoric increasingly crept into northern publications such as the Nation. The American Social Science Association, for instance, which was formed after the Civil War to organize professional and quasi-professional research and “reform” movements, took on an increasingly partisan and ideological tone, crystalizing an elitist, reactionary political interest that sought to withdraw government from “interference” in the market, particularly in the South. Crucially, this is exactly the same critique that Buchanan and his ilk later mounted against the civil rights movement: empowering labor, especially black labor, was dangerous to economic development. Moreover, state fiscal policies borne of popular democracy and characterized as redistributive—for example, public goods such as an integrated public school system—constituted an illegitimate perversion and subordination of government to “statist,” “rent-seeking” special interests. When seen in the context of its birth—as a backlash to civil rights—it is impossible not to interpret Buchanan's Public Choice theory as a politically motivated hack job. But this alliance did not rely on anything like Calhoun’s flagrantly antidemocratic emphasis on property rights above all. In an essentially democratic political context, the alliance could undermine public support for equal rights and egalitarian economic policies by playing off race and class divisions. It worked, and thanks in large part to Buchanan and the intellectual movement he represented, it worked again in the 1960s and ’70s. MacLean argues it is working right up through our present moment—a formidable challenge to the scholars thus implicated, and hence an explanation for the hostility with which they have received her book. Buchanan’s motivations during the civil rights era are seen most starkly in the example of education. Following the Brown v. Board of Education (1954) ruling, the state of Virginia implemented a policy of “massive resistance” to fight federally mandated integration. Schools across the state shut down during this time. When that extreme stand caused its own backlash—in the form of moderate white opinion that just wanted to get the schools open again—Buchanan constructed and presented an alternative: total education privatization. If public education had to be integrated, and the federal government was not going to back down in the face of state resistance, why not just eliminate public education altogether? It was a means to buy off moderate white opinion while keeping the racial hierarchy intact and thwarting the federal government’s “interference” in Virginian affairs. While the rest of the state balked, the Prince Edward County school system took that radical step, staying closed for five years rather than integrate and instead handing out private school vouchers. Public choice economics is an approach that asks how special interests can seek “rents,” or income unrelated to economic productivity, by getting self-interested bureaucrats and government agencies to regulate in their favor. It examines the impact of institutional rules on economic outcomes, usually from the standpoint of an assumption that market processes naturally align with the public interest but governmental processes do not. Farrell and Teles are some of the only non–Virginia School heirs to enter the fray when it comes to the Democracy in Chains controversy, and for that, I applaud them. But this decontextualized take on Public Choice theory reads quite differently divorced from the circumstances of its birth. Indeed, in this reading, it would seem the progenitors of this theory might have in mind the corrupt courtiers surrounding a hereditary monarchy, using its arbitrary and illegitimate power to enrich themselves. Farrell and Teles attempt some historical whitewashing by claiming that Public Choice can also explain the corruption that infects Donald Trump’s administration—likely a bid to gain the sympathy of readers who might tend more toward MacLean’s politics than Buchanan’s. What this point of view totally overlooks, however, is that Public Choice theory evolved to explain what happened when, for the first time in a long time, black people won the vote. It reinterprets the outcome of the struggle for civil rights as the capture of government largesse for the benefit of social leaches who would otherwise “fail” in a fully free market. If the insight that Public Choice has to offer is just that governments are sometimes inefficient, democratic politics may not always serve the public interest (however defined), and special interests vie for power, then it is not a very original theory. What is original about it is also what is antidemocratic about it: the reinterpretation of social movements with political aims as inherently illegitimate and prone to “interfere” in “natural,” and also optimal, economic outcomes. If public education had to be integrated, why not just eliminate public education altogether? This was the means by which Virginia kept the racial hierarchy intact. MacLean further claims that not only was Buchanan’s scholarship motivated by resistance to federal civil rights protection, but that his career, his institute, and his professional network were designed and funded to that end. Indeed, the Virginia School of economics was created as an intellectual-political machine, one that would supply a respectable way to oppose public goods and the political fruits of the civil rights revolution without having to resort to explicit, ugly racial terms. In that, MacLean is right as well, but her particular emphasis on Buchanan lets the rest of the profession off scot-free. Among economists, Buchanan certainly led the way on the civil rights backlash. But he was not alone. The year after Brown v. Board was decided, Milton Friedman independently proposed an idea of school vouchers that mirrored Buchanan’s: rather than integrate public education, why not just end it? The theory of human capital—the idea that what workers earn in the labor market is a result of an individual’s education and marketable skills—also arose in this era to direct scholarly attention away from systemic discrimination and employers’ power over workers as explanations for wage inequality. And the new field of New Household Economics tried to rationalize gender inequality as arising from choices by women and men to undertake different roles in the household versus the labor market. New Household Economics could even be further interpreted as a means to cast doubt on the idea that involuntary unemployment is a social ill, or even that it is possible, if the “real” explanation for not having a job is the worker’s own “choice” to instead work in the household. Moreover, a recent paper by the Center for Economic and Policy Research—by no means the first to make this argument—collects a large body of evidence that the Federal Reserve adopted its “dual mandate” of full employment and price stability in the 1960s in order to counter the threat of urban violence that was thought to be caused, at root, by unemployment among black populations. The ostensible failure of that policy during the inflation crises of the 1970s is what laid the groundwork for the “Rational Expectations revolution” in macroeconomics, which tried to reduce political influence over the central bank’s policy-making in favor of economists’ “expertise.” It also sought to eliminate any commitment on the central bank’s part to equalizing labor market outcomes. The ideology behind the (over-)complicated theorizing was that a “special interest” had gained control of, or at least influence over, economic policy and had thus perverted that policy in its favor—very similar to Buchanan’s Public Choice. The methodological innovations that revolution introduced into the field were enormously influential and remain so, as does the antidemocratic, elitist ideology. Of course there was no shortage of funding to support this thinking. The Volker Fund, which gave the seed money for Buchanan’s institute at the University of Virginia, also funded the creation of the “Law and Economics” program under Aaron Director at the University of Chicago Law School. That program gestated a revolution in antitrust law and regulatory policy. It was also funded by the Olin Foundation, whose benefactor, John M. Olin, was motivated by his disgust toward university administrators for being unwilling to face down the demands of minority students. This was the same motivation that prompted Buchanan to write Academia in Anarchy (1970), a screed against the public university in the late 1960s, which he saw as operating outside the direct control of its benefactors in the state legislature and the business establishment, prone to “occupation” by student protestors, and under the supposed ideological stranglehold of its left-leaning tenured faculty. But even among these many examples, Buchanan’s Public Choice scholarship was unique in its flagrant ideological motivation. When seen in the context of its birth—as a backlash to civil rights—it is impossible not to interpret it as a politically motivated hack job, albeit one with strong and disturbing links to the rest of economics. One of the most startling revelations in MacLean’s book, though she is not the first to observe it, is that Buchanan overtly listed the ideological positions of his students and professional colleagues when recommending them for jobs and to outside funders. That is something you only do if you are operating an ideological political machine, not a scholarly endeavor, and the fact that such behavior was embedded in the academic economics profession could not be more revealing. Even if today’s economists are willing to overlook the racist origins of Public Choice theory, and even if they are willing to ignore the explicitly political—not scholarly—aims of the subfield, they should at least find it impossible to see past how the Virginia School privileges abstract theory over data. As Moreton writes, referring to Buchanan’s best-known book, The Calculus of Consent (1962), “Reviewers noted that their analysis occurred entirely ‘outside any context of information,’ but as long as it was not required to account for real-world phenomena, their ‘ingenious logic’ produced a plethora of useful insights.” As empirical research has continued to undermine those insights, the Virginia School has been less than gracious, stubbornly unwilling to be held accountable by the real world. Ideologically-motivated private funding across academia provides a full-employment program for “scholars” who espouse its very particular brand of propaganda. For an example, look no further than the early 1990s, when economists David Card and Alan Krueger published two groundbreaking papers. Setting out to test the proposition that increasing the minimum wage would reduce employment, their research design focused on contrasting the change in employment in New Jersey, which had legislated a minimum wage increase, and Pennsylvania, which had not. They collected data from fast-food restaurants in each state, before and after the changes took effect. The basic empirical approach was “difference-in-differences”—in other words, that one could uncover the “true” impact of the minimum wage increase by looking at how the before-and-after comparison differed in New Jersey versus the “control” of Pennsylvania. That research had a profound impact on the economics profession, introducing the “credibility revolution,” as some of its foremost proponents have dubbed it—namely, the use of empirical techniques to come as close as possible to drawing causal inference about how the world works. But the credibility revolution also threatened much of the received wisdom in economics about optimal policy: it turns out that increasing the minimum wage does not destroy jobs, that liberalizing international trade does not benefit all parties, that transfer programs targeted at the poor do not reduce their willingness to work, and that reducing taxes on the rich does not cause economic growth (nor does reducing taxes on corporations cause them to invest more). The inverse relationship between quantity demanded and price is the core proposition in economic science, which embodies the presupposition that human choice behavior is sufficiently rational to allow predictions to be made. Just as no physicist would claim that “water runs uphill,” no self-respecting economist would claim that increases in the minimum wage increase employment. Such a claim, if seriously advanced, becomes equivalent to a denial that there is even minimal scientific content in economics, and that, in consequence, economists can do nothing but write as advocates for ideological interests. Fortunately, only a handful of economists are willing to throw over the teaching of two centuries; we have not yet become a bevy of camp-following whores. The field of economics as a whole has not always been as welcoming to new methodologies and insights as it should be, but, starting with Buchanan’s temper tantrum in the Wall Street Journal, the Virginia School has been downright hostile. Since the mid-1990s, the Buchananite fringe has further separated itself from the mainstream, proving that the “scholars” who continue to espouse his positions, in contravention of the evidence are the real advocates for ideological interests. But what would we expect from people with appointments in institutes and departments that are funded by right-wing billionaires and clearly ideologically inflected? MacLean’s final chapter discusses how Charles Koch effectively seized control of the center at George Mason University that was named after Buchanan and used it for flagrantly political purposes, alienating Buchanan from his own life’s work in his final years. The march of ideologically-motivated private funding across the academic economics landscape has been notable and aggressive in recent years, and it provides a full-employment program for “scholars” who are trained in and espouse its very particular brand of propaganda. Its benefactors, after all, see academia as dominated by left-wing scholars, and hence requiring the antidote of an ideological-professional network churning out agitprop to fuel a political movement on behalf of the rich—nothing like the job description of actual scholars and academic researchers, whether or not they tend to the left. And so when nothing that these institutes and individuals produce makes it into the leading journals or marquee conferences, they create their own, complete with all the trappings of academic seriousness and fancy-sounding awards, appointments, publications, and so on. This smoke and mirrors strategy serves a dual mission. First, it deceives those in the media and policy-making world into believing that actual scholars sanctioned the work—or at least, allows them to plausibly claim this is the case. And second, it deceives its own insiders into thinking they are successful, high-status academics, not coddled cogs in a ruthless ideological-political machine. None of this, of course, would survive in a true academic free market. I will conclude with perhaps the most disturbing and speculative aspect of MacLean’s book. She contends that the intellectual-political machine that started with Buchanan and has continued to this day with right-wing billionaires is unlike anything that has ever happened in American history. This is because the Buchanan–Koch nexus does not seek to simply sway public opinion, but rather to subvert and overthrow it. As this review has made clear, I am in sympathy with MacLean’s characterization of the Virginia School as profoundly antidemocratic and anti-academic, but it is very hard to sustain any argument that says that something going on in the present is fundamentally different than anything which came before it. After all, the political movement based on a combination of right-wing economic policy and overt white supremacy has existed throughout this country’s history, and it achieved great success at controlling economic policy in the Gilded Age—the very era that Buchanan and his circle point to as their ideal. That the interest MacLean describes is longstanding does not imply one way or another that it will inevitably be defeated or that it will inevitably triumph. MacLean clearly fears and suspects the latter, however, and provides good reason, showing how the right-wing economic and social agenda adapted its tactics and rhetoric since the years of massive resistance. While the closest it previously came to seizing national power was installing Calhoun as vice-president and Roger Taney as chief justice of the Supreme Court, it can be argued that in 2016, it succeeded in electing a president, and in 2017, it ushered in white supremacist street violence at the university where Buchanan did his most influential work. As such, MacLean’s book is an important warning, and it should be read by all despite its rhetorical shortcomings. She at least has glimpsed the enemy, and it would be foolish to ignore her testimony to spite the messenger. [Author Nancy MacLean is the author of Behind the Mask of Chivalry and Freedom is Not Enough. She is the William Chafe Professor of History and Public Policy at Duke University and lives in Durham, North Carolina.